Jurgen Klopp is a brilliant football manager, but a brilliant person as well. After he was awarded December’s Manager of the Month award, following seven wins on the trot, he decided to take a picture with the award and all his backroom staff – in front of a sign that read ‘Together Stronger’. The run of wins took Liverpool from behind Manchester City to in front of Pep Guardiola’s side, with brilliant victories against Manchester United and Arsenal some of the highlights. 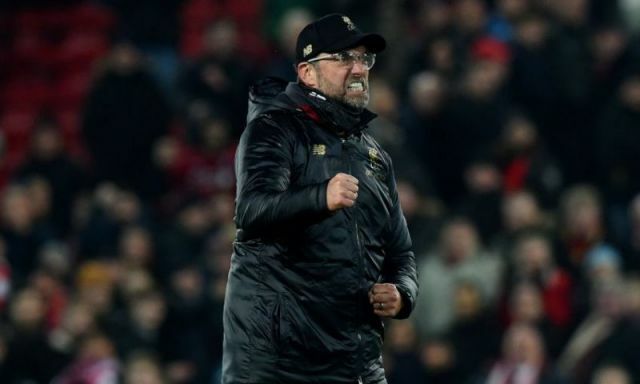 We can imagine most other bosses would have enjoyed the limelight alone, but the fact Klopp purposely got his team together shows his humility and his ultimate belief that any success Liverpool garner will be down to everyone at the club – not just him or the team. 😆 | Klopp wins the manager of the month award… takes picture with the rest of his staff! Liverpool defeated Brighton yesterday, getting back on winning ways following defeats to Manchester City and Wolves. If you think Liverpool can go all the way, check out Sports betting Canada and see the array of offers they have. The site currently rates us as second favourites behind City to win the title, despite our current four point lead at the top of the table. Next in line is Chelsea, interestingly, but we realistically don’t think Maurizio Sarri’s side will be an issue due to their lack of potent forward, although Gonzalo Higuain arriving may change that. Sports betting Canada also provides information on the multiple markets available to punters when it comes to all things Premier League, such as top goalscorers, individual matches and more. We have slight problems in defence, but we fully trust Fabinho to do the business alongside Virgil van Dijk – who has been jaw-droppingly good throughout the campaign. The Brazilian did superbly at the Amex, but will likely head back into midfield, with Joel Matip set to be fit for next week’s Crystal Palace tie. We’ll be heavy favourites for the Anfield clash, but have a murky past against the Eagles so need to be careful. Dejan Lovren is also in contention to be back for this game, while Joe Gomez is set to be out until February. The young Englishman is our second best defender after van Dijk, so we hope he can have a huge part to play until the end of the season. Tottenham lost against Manchester United on Sunday afternoon, which puts them nine points behind – making it look more like a two horse race for the title. Manchester City beat Wolves on Monday evening, cutting the seven point gap to just four. City are an extraordinary side, but the manner in which Liverpool have consistently racked up clean-sheets gives us a great chance at this stage.